I was a good student in high school. However, like many who had early success, I hit a wall my freshman year. I soon realized that the learning strategies I employed in high school were ineffective in the more challenging environment, particularly in engineering. In my subsequent years as a student, advisor, researcher, dean and now advocate for broadening access to college and engineering, I’ve observed that there are one of two ways that students respond to academic (and similarly professional) challenges like mine. The first group shrinks back because their “smartness” is tested. In response, they pull back their effort, change their major, transfer to another college, or drop out completely. The statistics bear this out. Barely more than half of all college students earn a four-year degree within six years of entering as freshmen, and 28 percent don’t return after their first year! If they’re a male or a person of color — African American, Native American or Latino — their odds of obtaining a bachelor’s degree in six years are even worse. The other group finds an embedded, hidden resolve to face down this challenge. They apply themselves in new resilient ways, like I did (miraculously). A 38 on my first physical chemistry exam caused me to buckle down like never before. But working harder is not the only effective response. It’s true: Students need to work harder by putting in more hours to prepare for class. According to one recent study, the average number of hours college students spend doing schoolwork outside of the classroom has dwindled over the past 50 years, from 24 hours per week to only 15. But putting in more time doesn’t always translate into better grades or deeper learning. No, to be effective, students need also to learn how to work smarter. 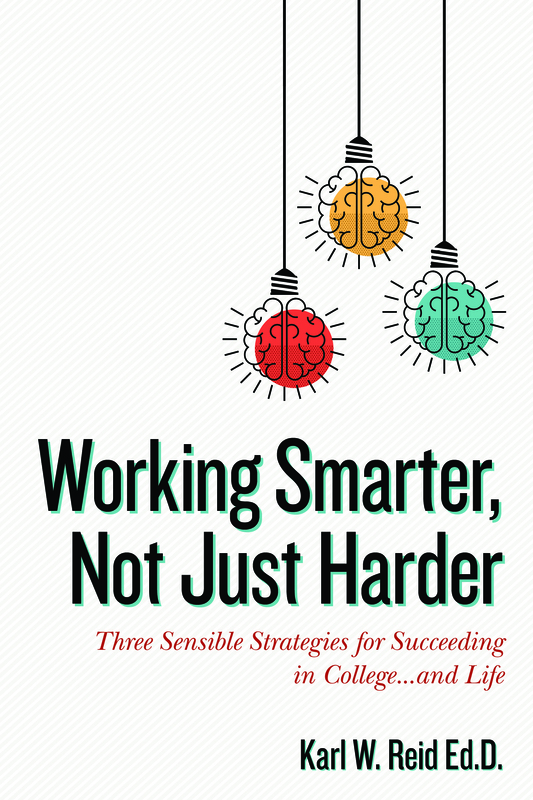 In my new book, “Working Smarter” guides high school and college students through the learning approach that helped turn things around for me as an undergraduate, an approach that I refined as a doctoral student, a freshman advisor and a college dean. It will help students get smarter — not just intellectually, but smarter in the way they approach their work…any work. Ultimately, I’ve had great success: two degrees in engineering from MIT, a doctorate in education and a fruitful career — first in the software industry, then in higher education, and now as executive director of a professional engineering society. But it didn’t come easily. This book provides a model, one that students can adapt to their own style and situation. And it offers a mindset — a way of thinking — that will underpin those strategies as they learn to adapt them to meet their particular needs. These strategies, I’ve discovered, make all the difference between successful and unsuccessful students. I call them “shifts,” because most students have to dramatically shift their thinking and their actions in college to succeed. Doing the same thing harder and for longer periods of time is like revving the engine in lower gears. It doesn’t get the job done! The first one, The Attitude Shift, focuses on developing a new mindset about their intellectual ability, and on the importance of confidence and how to rebuild it, especially after they suffer setbacks like I did. That’s Chapter 2. The Connections Shift (Chapter 3) shows how important it is to engage faculty and peers on campus, and how to do it. This chapter teaches students how to approach teachers, even if they’re shy, and how to utilize study groups of fellow students to maximize their learning. And finally, The Behavior Shift (Chapter 4) offers practical steps for improving grades and deepening their learning. This chapter provides both the rationale behind, and the steps toward, developing the kind of comprehensive approach that has helped countless students succeed. Everyone struggles at some point in college and in their career. “Working Smarter” is designed to help them face down these challenges and learn to work smarter. What strategies worked for you to face down your academic and professional challenges?